Location: The ideal location for dahlias is one in full sun, however the plants will tolerate partial shade. Soil: Dahlias prefer a sandy, well drained loam. If the soil is heavy, the addition of mulch or sand is advisable. If the soil is too sandy the addition of peat moss is advisable to retain moisture. A soil with a pH of 6.6 will work with 6.5 being ideal. Avoid planting close to trees, shrubs or in perennial bed where they will get shaded out. Height & Spacing: Dahlia plants vary in heights from one foot to seven feet. Check variety for height, and plant the taller ones to the rear of the garden. 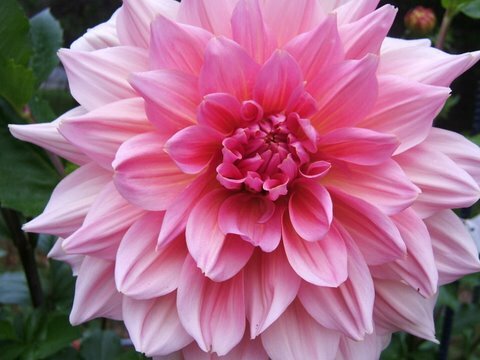 Space your dahlias according to bloom size-the large varieties should be planted two to three feet apart, smaller ones one to two feet apart. Fertilizers: About two weeks before planting, broadcast 10-10-10 over the soil, or a one inch layer of compost, and work into the soil. Dahlias may be foliage-fed with a fertilizer such as Bonide Pro-Bloom 3-4-17. A granular balanced fertilizer may be sprinkled on the soil in July and watered in.